It was Solidworks World 2014 when the then CEO of Solidworks Bertrand Sicot made his entrance atop a rather intimidating mechanical spider. Not to be outdone in the entrance stakes, Sicot’s successor and current CEO Gian Paolo Bassi made his way to the stage this morning riding one of those pedal-powered tables normally piloted by beer-fuelled stag parties in Amsterdam. Stranger still, Bassi – joined by members of the Dassault Systemes corporate team – appeared to be enjoying a sumptuous feast complete with intricate tablecloth, goblets, and chandelier. To this end, Bassi made a series of product announcements, all enthusiastically received by the audience, all concerned with ensuring Solidworks keeps pace with new, digitally-driven models of design and manufacture. Solidworks Collaboration Services: a cloud-based system to aid the agile sharing of ideas amongst designers. A napkin sketch in cyberspace if you will. Bassi stressed that Solidworks is committed to embracing a two-pillar future – covering the desktop and the cloud – to facilitate seamless collaboration across the 3D Experience Platform. ”Why are we doing this? The truth is that you have asked us and we feel compelled to deliver the ultimate flexibility to give you choice about how you grow your business,” he said. It’s a bold claim and it will be interesting to see how the offer develops. Dassault hopes that its extensive network and in-house expertise will see the platform succeed against a few similar networks already up and running. 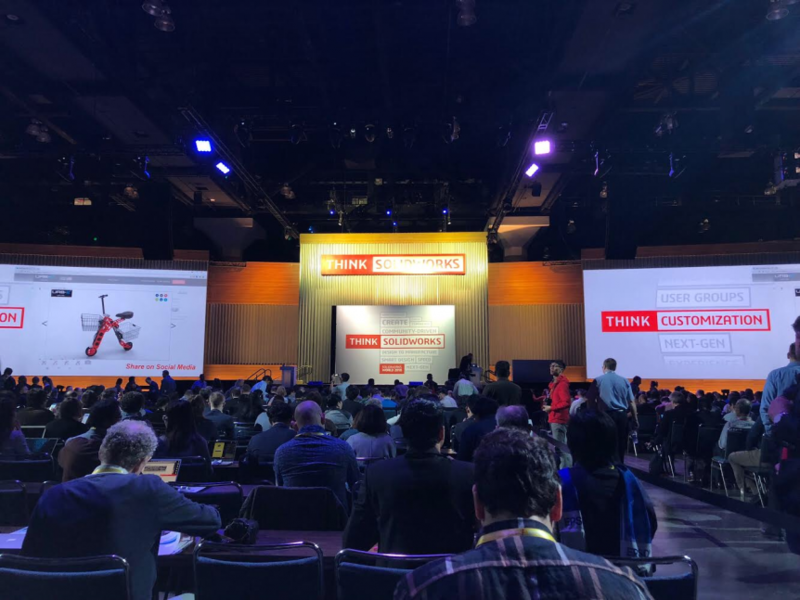 Solidworks senior product director Kishore Boyalakuntla was joined by Solidworks power user (and familiar face around Solidworks Worlds) Edson Gebo to update the convention on the development of the cloud-based XDesign product. Gebo, who was embedded at Solidworks as a consultant on the product for a couple of months, praised the platform’s closeness to the desktop version of Solidworks. “There’s lots of good tools and now I can use it on my iPad and bring it to a customer site,” he said. XDesign, which was first floated at Solidworks World 2016, is in its ‘lighthouse’ development stage. Currently there are 20 users and Boyalakuntla explained that Solidworks would like to add 30 further adopters in the next few months before scaling to “several thousand” users by the end of the year. With the product announcements covered, today’s keynote speech was delivered by Professor Neri Oxman who leads the Mediated Matter research group at MIT. Hopefully, New Design readers will be familiar with Oxman’s extraordinary work that sits at the intersection of computational design, digital fabrication, material science, and synthetic biology. Some of her most recent work includes Vespers, a series of 3D-printed ‘death masks’ that were part of the Design Museum’s opening exhibition ‘Fear and Love’. Oxman shared insights into her latest research, covering such enthralling territory as 3D printing in glass, creating structures in organic material, and a large-scale 3D print project that uses a rotating robotic arm to print an 80 foot diameter dome (“perfect for building structures on Mars,” she commented). Perhaps Oxman’s vision defines the Industrial Renaissance of which Gian Paolo Bassi spoke – ambitious, beautiful, limitless, and optimistic in humanity’s potential to improve the world.